T he name Columbarium is derived from the Latin Columba or “Dovecote”, the dove being the symbol of God’s spirit and peace. Today, many people are searching for an alternative to ground burial that offers beauty and simplicity. Cremation is one such alternative. on June 13, 2004, and has been established for parishioners and their family members to provide for the reverent, Christian disposal of cremated remains in an atmosphere of holiness and beauty. 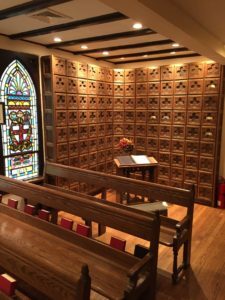 The Columbarium is under the direction and supervision of the Board of Trustees of the Resurrection Columbarium, who report directly to the vestry of the church. There are four such trustees with rotating terms, who include (as of June, 2004): William D. Cooper, President of the Board of Trustees; Ruth G. Dubas, Kenneth G. Mensing, and Barbara Boylan Wen. The Rector of the parish and the Property Manager are members ex-officio. In preparation for the installation of the Resurrection Columbarium, the Rector and the President of the Board of Trustees drafted a set of “Governing Articles”, and a “Proposed Purchase Agreement”, both of which are available upon request from the Parish Office, or from the office of the President of the Board of Trustees. Below are some frequently asked questions about the Resurrection Columbarium. Why do you call it a “Right of Use”? I’m really buying the niche, right? This is a legal term reflecting the fact that you cannot “buy” any portion of church property. Absolute title and control of the columbarium and all its component parts remain with and in The Church of The Ascension. Who is eligible to purchase a Right of Use for one or more niches in the Resurrection Columbarium? Our columbarium provides a service for parishioners, and is not intended for the general public. The right to purchase a Right of Use for one or more niches shall be limited to adult members of the parish who are communicants in good standing, as defined by the Canons of The Episcopal Church. The actual use of any niche is restricted to the purchaser, and members of his or her immediate family, which is taken to mean a spouse, children, domestic partner, parents, siblings, and grandchildren. How many sets of remains can be accommodated in each niche? There are two sizes of niche in the Resurrection Columbarium. The first, intended for use by one or two persons, has dimensions of 8.5″ tall, 9″ wide and 6.75″ deep. Family niches are larger. It is highly recommended that you arrange to see the Columbarium prior to purchasing a Right of Use for a niche. When you say that a niche can accommodate one or two sets of cremated remains, what do you mean? When we say that a niche can hold two containers of cremated remains, we refer to the standard, rectangular plastic container in which cremated remains are generally returned from a crematory. 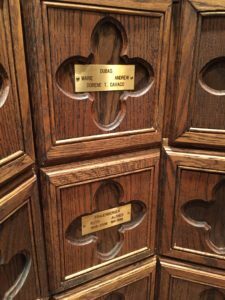 What happens if I move, or wish to have a family member’s cremated remains removed from the Columbarium? What happens if I purchase a Right of Use, and then change my mind? Subject to certain guidelines (as found in the Purchase Agreement and in the Governing Articles for the Resurrection Columbarium), a family member who is legally entitled to do so may arrange for the removal of cremated remains from the Columbarium. Likewise, a purchaser of a Right of Use of a niche (or other person legally entitled to do so) may surrender their Right of Use. What is the cost involved to purchase a Right of Use for a Niche? For a niche designed to accommodate 1-2 containers, the price is $1000.00. For one of the “Family Niches”, the price is $2,250.00. This price includes a brass nameplate and costs associated with the first inurnment. There is an additional fee of $250.00 for all inurnments subsequent to the first inurnment. All fees must be paid prior to the placing of any cremated remains in a columbarium niche. How do I arrange for a nameplate? The nameplate and the engraving there on shall be provided by the church. For purposes of uniformity and general esthetics, the engraving is limited to the Christian name, middle or maiden name (or initial) and surname, with the years of birth and death. When may people visit the Columbarium? Visits to the Resurrection Columbarium may be made during normal business hours when the church is open. Special arrangements can easily be arranged by phoning the Parish Office. There is no visiting during the public liturgies of the church. What if I would like to purchase an urn, rather than the standard-issue container? If you intend inurnment in the columbarium, you should inform your funeral director of the niche dimensions. It is your responsibility to ensure that any container(s) be of appropriate dimension for the use intended. In the event that you are pre-planning your funeral, you may arrange to have your funeral director of choice come with you to look at the niche(s) you have selected, in order to help you select a container of appropriate shape and size. Is there a Service for the placing of the cremated remains within the niche? Yes, indeed there is; the Service of Committal from The Book of Common Prayer is both beautiful and comforting. The date and time of such a service will be scheduled at the mutual convenience of the family (or other designated person) and the Rector of the parish, who will officiate at the Committal. 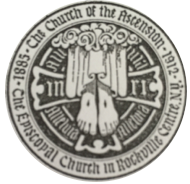 Another Episcopal priest, or a Christian minister of another denomination, may officiate at the request of the family and at the invitation of the Rector. May I arrange to bring some family members in to view the Columbarium and see an open niche? Certainly. Simply telephone the Parish Office. The Rector, a member of the Board of Trustees, or a member of the parish staff, will be happy to meet with you. If The Church of The Ascension were to be dissolved, or should cease to exist, what would happen with the remains in the Columbarium? Should such an unlikely event occur, appropriate steps would be taken to re-locate the cremated remains to a place deemed appropriate, fitting, and proper, conforming both to the laws of the State of New York and guidelines established by The Episcopal Church, and the sound judgment of the Vestry. The Church would try to notify all holders of such a Right of Use as to the changed circumstances. If you wish to have flowers in memory of a loved one, you may arrange to have small vases placed on the altar in the Chapel of the Resurrection. Arrangements must be made through the Parish Office. All such memorials will be listed in the Sunday worship bulletin. At certain times during the year (i.e., Christmas and Easter), additional floral arrangements will be placed in the columbarium at the discretion of the Rector. Any and all other decorations, floral or otherwise, are strictly prohibited, and will be removed.